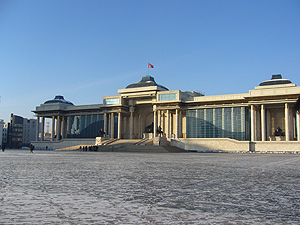 The Shochuhi memorial before the disaster. 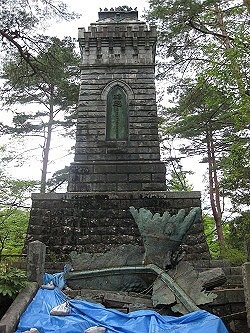 The Shochuhi memorial after the disaster. The black kite in bronze that was perched atop the pedestal has fallen beak first to the foot of the pedestal. A number of cultural properties were seriously damaged by the Great East Japan Earthquake last year. Within its Secretariat in the National Research Institute for Cultural Properties, Tokyo, the Committee to Rescue Cultural Properties Damaged by the Tohoku Earthquake and Tsunami has been involved efforts to rescue cultural properties in regions like coastal areas hit by the tsunami. As of January, the Committee worked to rescue the Shochuhi memorial (Gokoku Shrine, Miyagi Pref.) erected on the ruins of the keep of Sendai Castle (or Aoba Castle). The Shochuhi memorial was erected in 1902 to commemorate the fallen from the Imperial Army’s 2nd Division, which was located in Sendai. The memorial features a black kite in bronze with its wings outstretched atop a stone pedestal close to 20 m high. The recent earthquake caused extensive damage and left the memorial in a pitiful state, causing the black kite at the top to fall to the foot of the stone pedestal and breaking its left wing. During work in January 22nd and 23rd, bronze fragments that could be collected by hand were collected by personnel in conjunction with individuals from the Gokoku Shrine. Future steps like movement of the bronzed black kite itself were also discussed. The Shochuhi memorial was crafted on commission by the Tokyo Fine Art School (now the Tokyo University of the Arts). Masao KAWABE designed the memorial, Ichiga NUMATA crafted the original of the black kite adornment, and Sanshiro SAKURAOKA and Shinobu TSUDA cast the black kite in bronze. In other words, the memorial brought together the cream of the Fine Art School. The plaque in the center of the stone pedestal is inscribed “Shochu” [summoning the spirits of the loyal fallen] as was written by Prince KOMATSU Akihito. Conveying heroism, this plaque was exempted from metal requisition during the War. How will the damaged plaque be salvaged and will it be passed on to future generations? Numerous difficulties, such as raising funds, are anticipated, but the memorial is a valuable cultural property. With this in mind, we at the Institute fervently hope to return the plaque as a new symbol of the spirit of recovery. Research was conducted on intangible culture in Armenia. The Japan Center for International Cooperation in Conservation has implemented international projects to primarily conserve tangible cultural properties in the countries of the Caucasus and West Asia. In January 2012, Migiwa Imaishi of the Department of Intangible Cultural Heritage conducted a basic study of intangible cultural heritage in those countries in order to explore the potential for international research exchanges and cooperation in the field of intangible cultural heritage. As part of the study, Imaishi conducted documentary research by visiting several museums, including the History Museum of Armenia and the National Museum of Ethnography and History of the Liberation Struggle of Armenia. 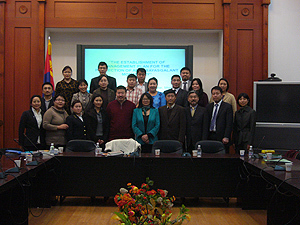 Imaishi talked with ethnologists and also studied the current state of research and transmission of culture in Armenia. Ethnologists acknowledge that much of the “traditional culture” of Armenia was lost during the period of Soviet rule, but pieces of culture are remembered and continued to this day. Indigenous beliefs and customs that have fused and coexisted with Christian beliefs and customs are particularly interesting. One example involves eating manners and customs. There are various customs regarding salt and the use of special salt containers (such as pots shaped like a woman or bird) that remain culturally important. Likewise, each member of a family used to have his or her own wooden spoon, just like Japanese have their own chopsticks, so spoons symbolized each member of the family. 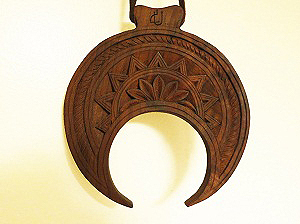 The Dovlat, a deity of the home, was also said to dwell in spoons. 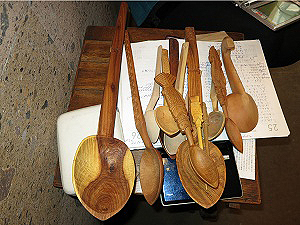 Spoons are also said to authorize the rights of housewives and had many magical uses, just like ladles and chopsticks in Japan. The potential for studies or research exchanges in some form must be explored in concert with local researchers. 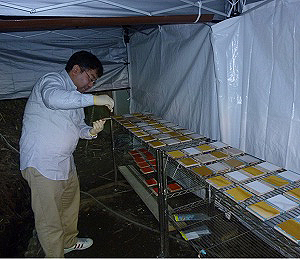 As part of a commissioned study on Development of Techniques to Prevent Color Paint Peeling at Kirishima Shrine and Work to Implement Those Techniques, the Center for Conservation Science and Restoration Techniques has studied biological deterioration of traditionally painted areas of Kirishima Shrine. Traditional painting techniques used organic substances such as animal glue and are usually susceptible to biological deterioration by microbes like mold. 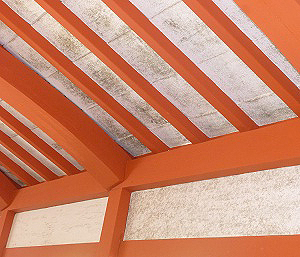 If mold grows, it can seriously mar a building’s appearance. Moreover, mold degrades the proteins in animal glue that serve as a binder, causing pigments to separate from the painted surface. Metabolites also cause pigments to discolor and dissolve. As a result, the physical deterioration of painted areas accelerates. Kirishima Shrine has suffered damage, i.e. extensive growth of mold, in areas that were painted traditionally with oyster shell white paint or ochre paint including walls of breezeways, the covered stone stairway, and the worship hall. This year, a microbiological study was conducted to identify the mold responsible and ascertain the impact of that mold on painted areas. Temperature and humidity changes on-site were also monitored and an exposure test with fungicides was also conducted to help devise optimal control measures. Environmental measurements revealed that the Shrine’s air temperature is lower than the air temperature of level ground and the Shrine has a relatively high relative humidity of about 70% as an annual average. The Shrine was found to have an environment conducive to the growth of indigenous microbes. During the on-site exposure test with fungicides, several agents were found to have fungicidal action, but some of the fungicides chemically reacted with the white paint and could lead to deterioration. One hundred and thirty-three fungal strains have been isolated from damaged areas. These strains were grouped based on colony morphology and analyzed phylogenetically and physiologically. Results indicated that 3 groups had highly prevalent fungal strains (i.e. they had the most strains isolated). These groups are presumed to play a major role in microbial deterioration of traditionally painted areas of Kirishima Shrine. Plans are to perform a more detailed analysis of the isolated strains and continue exploring measures to prevent and control microbial deterioration of areas with traditional oyster shell white paint and ochre paint in conjunction with exposure test results. 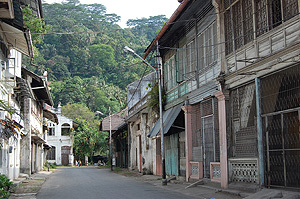 The historical district of the City of Padang, West Sumatra was seriously damaged by earthquakes occurring off the coast of West Sumatra in September 2009. Since November of that year, the National Research Institute of Cultural Properties, Tokyo, has continued to support the recovery process of damaged cultural heritage sites in the district. 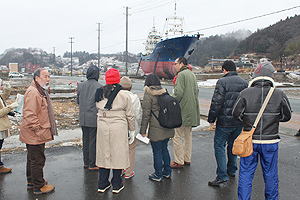 This year, field studies were undertaken by Japanese experts, and a local workshop focusing on the topics of earthquake-resistant construction, disaster countermeasures, and risk management was conducted from January 4th to 13th, 2012 within the framework of emergency programs by the Japanese Agency for Cultural Affairs. 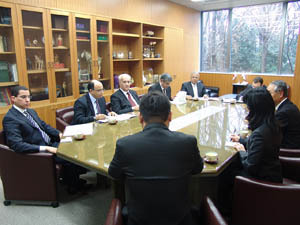 Afterwards, Indonesian experts were invited to Japan from January 19th to 25th. Proposed restoration efforts are based on Japan’s own experiences following the March 11th, 2011 disaster in Tohoku. At the workshop, examples of efforts to restore damaged cultural heritage sites in Japan were presented, and earthquake countermeasures and townscape preservation of the the historical district were discussed on-site. In addition to surveys of restoration of damaged historical buildings and townscapes, field studies proposed seismic retrofits based on basic structural surveys and those studies examined the architecture of traditional townhouses. Indonesian experts who were invited to Japan were able to talk with personnel actively working on restoration and earthquake countermeasures on-site in affected areas like Tohoku. This series of programs helped to clarify issues with reconstruction of damaged cultural heritage sites in Padang two years after the earthquakes. 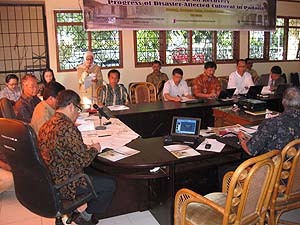 Further cooperation is needed for more specific action plans so that valuable historical heritage sites are not lost.